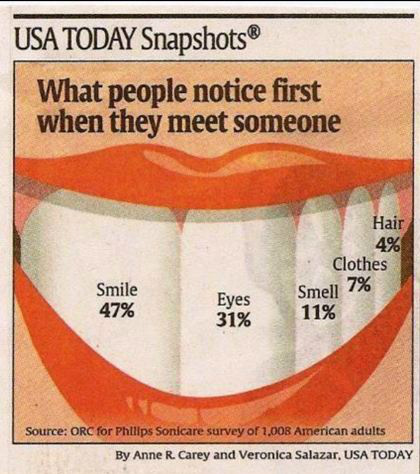 Your smile is important both socially and professionally! Top 5 reasons that smiling is so important! The simple act of smiling can do so much for you. Check out these 5 reasons to show off those pearly whites! Go ahead, give it a try! You will live longer! Smiling has real chemical effects on your body – even if you are faking it! Studies have found smiling will lower your heart rate, steady your breathing, and relax your body; which results in a stronger immune system. Appear more attractive and trustworthy to those around you. Another bonus is that psychological research has shown that attractive people are perceived as more successful, intelligent, and friendly. Appear younger! Smiling is a natural face-lift! Be more memorable. Studies have shown you are 3x more likely to be remembered if you are smiling than if you display a negative or neutral face. Be more successful! The previous three effects lead to promotions and more yes’s from others. General rules for esthetic dentistry. Take photos of smiles for posting slightly superior – those and straight on favored over inferior view This may be due to fact as go higher the smile can appear to change from reverse to straight to parallel. When patients look at themselves in mirror they get top view (good thing). When hold mirror, should hold straight or below to give straight or top view. Research on the esthetics of smiles and dentistry. With the lower-face view: ideal smile arc, ideal buccal corridor, maximum gingival display, upper to lower midline, and occlusal cant important. The principle of tracking the curve of the lower lip was confirmed, even though lip curvature varies. For the full-face view, the raters preferred less maximum gingival display, less buccal corridor, more upper to lower midline discrepancy, and less cant of the occlusal plane. Weakest concerned whiteness and proportion. The largest minority view was the straight embrasures. Females had stronger preferences in all conditions. Whites strongly rejected the diastema. Significantly lower attractiveness ratings were found for flat smile arcs and excessive buccal corridors. Orthodontically treated subjects had significantly poorer smile scores than the subjects with “normal occlusion.”!!!! Arcs of curvature of the incisal edges of the upper incisors and the upper border of the lower lip important. The buccal corridor ratio appeared to be of no significance to an attractive smile. Upper lip curvature was most desirable when the corners of the smile were above the midline of the upper lip. However, those smiles in which the corners of the smile were below the midline of the upper lip were attractive if they possessed the most desirable relationships of each of the other components. Full, broad smile with minimal “buccal corridors” seems to please dentists as well as laypersons and age and gender were not relevant. 15% buccal corridor was seen as most esthetic according to Nimbalker JPD 2018. My only issue is the people choose the middle option which may not be a coincidence. “There are two worlds; the world we can measure with line and rule, and the world that we feel with our hearts and imagination.“-Leigh Hunt. The buccal corridor creates an added illusion of reality. If buccal corridor completely filled, ie the “molar to molar smile” = characteristic of a denture.